In this class you will learn how to make a “school sack” used by boys and men in the 16th century. There are many kinds of purses that Germans used in the 16th century and most of them are made from leather. 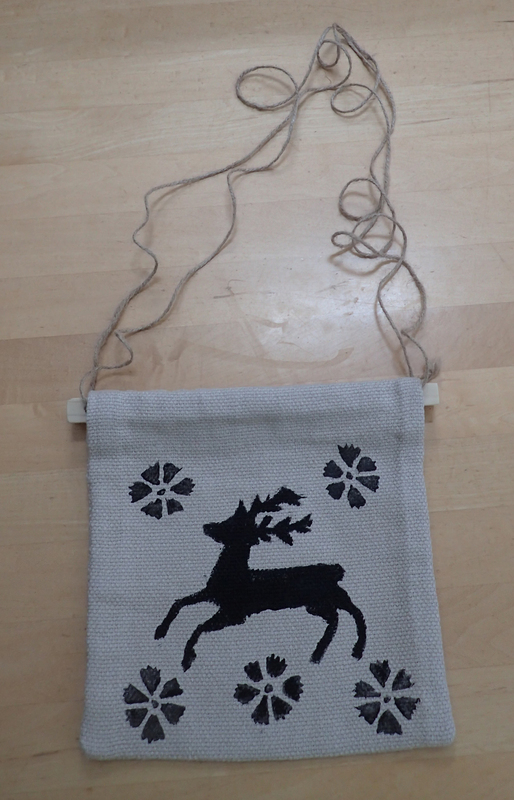 This bag is made from linen, has wooden handles and a jute shoulder strap. It is documented in an archaeological report titled Alpirsbach History of Convent and City. The report contains an image of the purse from the German National Museum as well as woodcuts showing school boys and a soldier using the bag. I have never seen an image of a woman using this type of bag, so I can’t claim that it’s appropriate for a woman to use. However, it’s your own choice as to whether you’d use it as a woman with your German peasant or Landsquenecht kit. Extant Purse: Canvas bag, Koperbindung. H 34 cm, W 30 cm. Nurnberg, German National Museum. The Alpirsbach bag was found in a monastery under the floorboards with other items such as shoes, three complete shirts, a doublet and fragments of other clothing. It is described as a stitched canvas bag. The handles are made from oak. The linen purse has two sleeves stitched in the top into which the oak “planks” are secured. 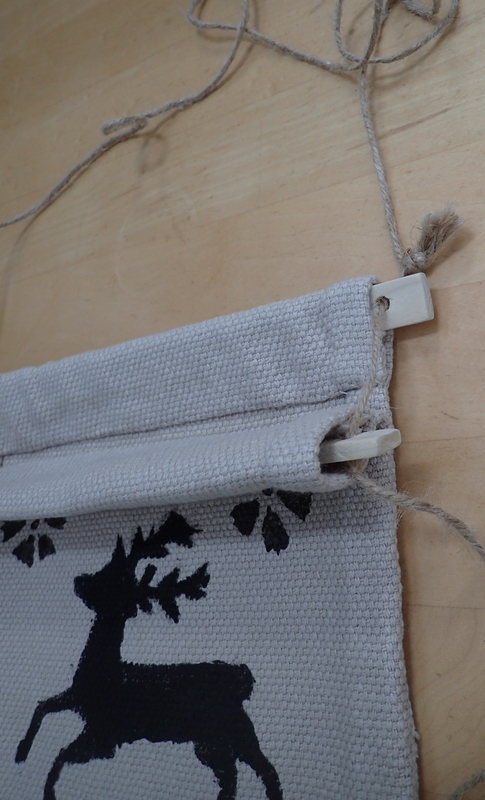 The handles have holes in each end through which cording was passed to make a shoulder strap. 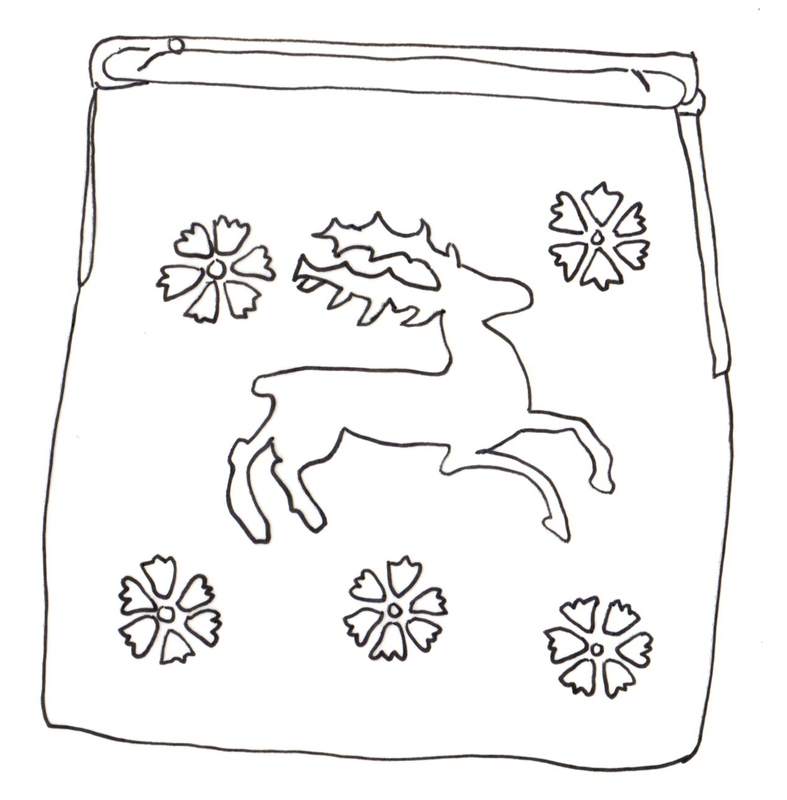 Above is my drawing of the Alpirsbach bag from the Alpirsbach History of Convent and City. There is pictorial evidence for school sacks / soldier’s bags. 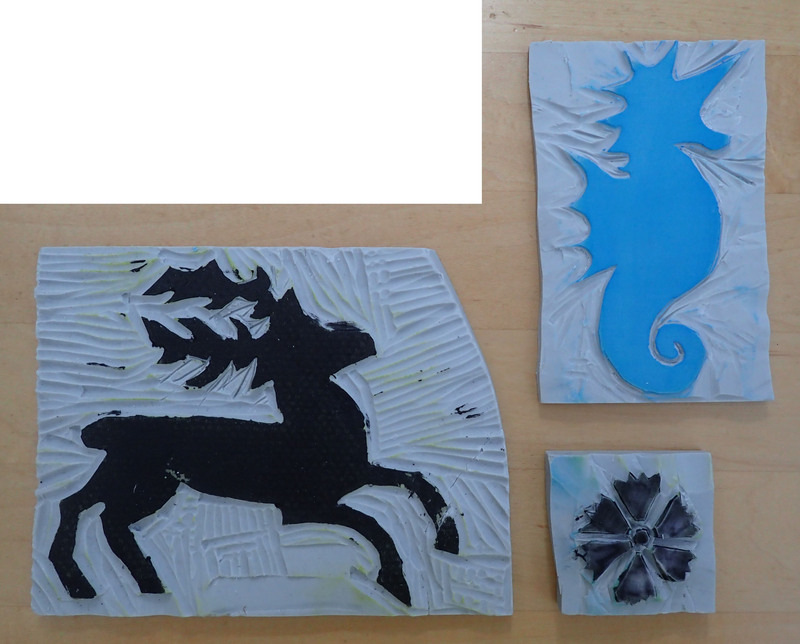 Since I do not own the woodcuts, I have re-drawn the images (the pertinent parts) below. Petrarca-Meister, Book Illustration Of the Artzney bayder Chick, woodcuts 1519/20 completed 1532. Urs Graf, Confinement, woodcut in the Calendar of Joh. Kungspergerfur 1508. Basel, Ojfentliche Art Collection. 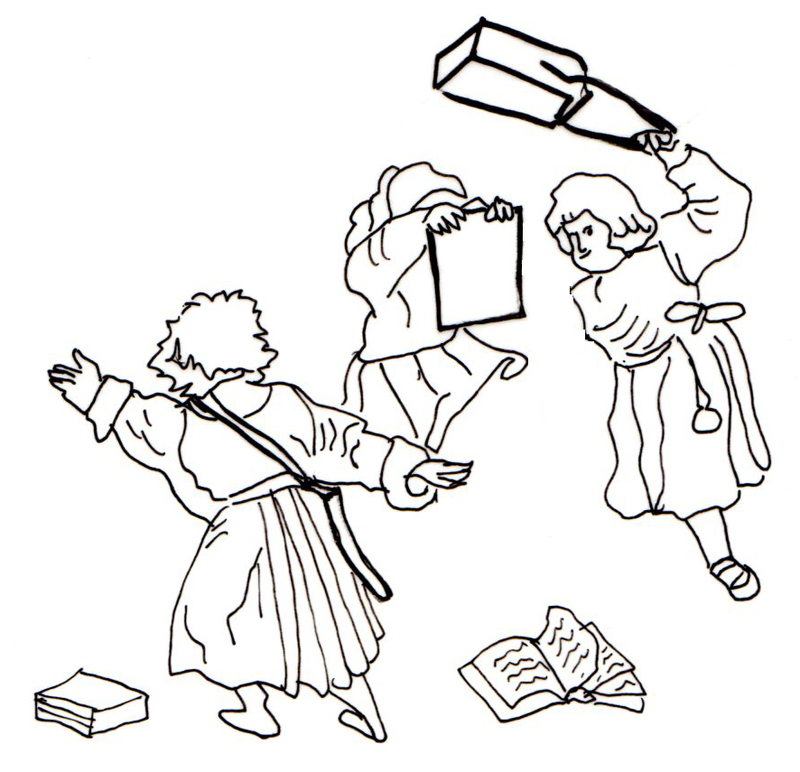 The first image is a school boys’ fight where the boys are swinging bags at each other or using them as a shield. I have highlighted the school sacks using thicker lines so they are easy to see. This woodcut is the image of a complete melee and it is hard to deduce where one boy ends and another begins. 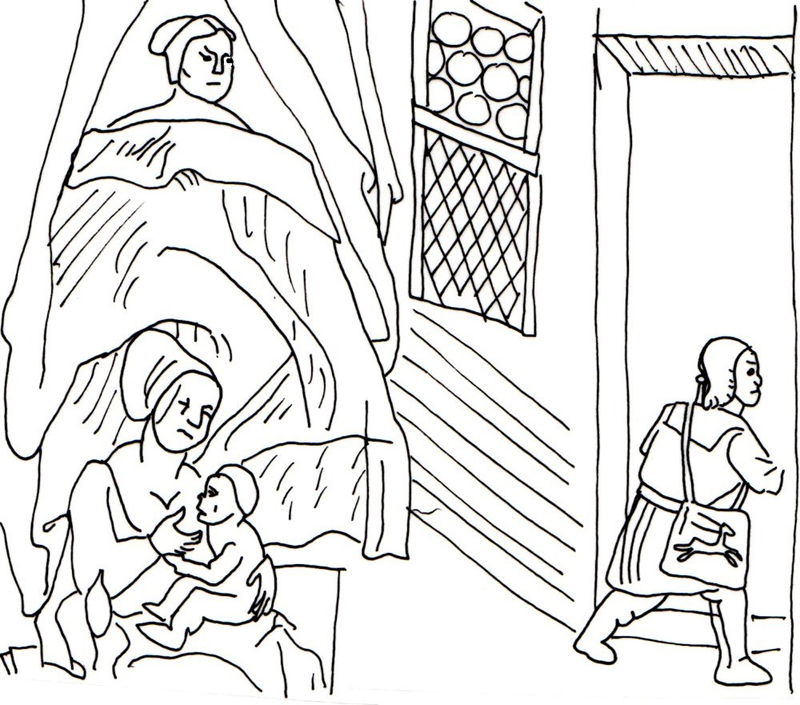 The second image is a young boy running out of a birthing room, presumably to give good news to the father. 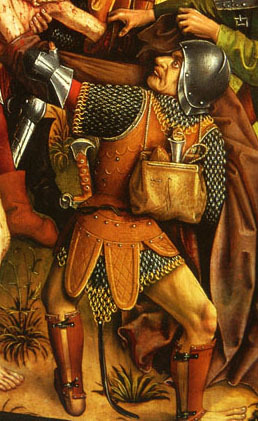 He is wearing a sack not unlike the extant sack found in Alpirsbach, with a deer printed on the side. The third image is a soldier. Wooden Handles – The wooden that we are using today are poplar. Linen – You can use any type of sturdy linen for the body of the bag. The pattern size is 14”x26”. Thread – Get thread to match your linen. 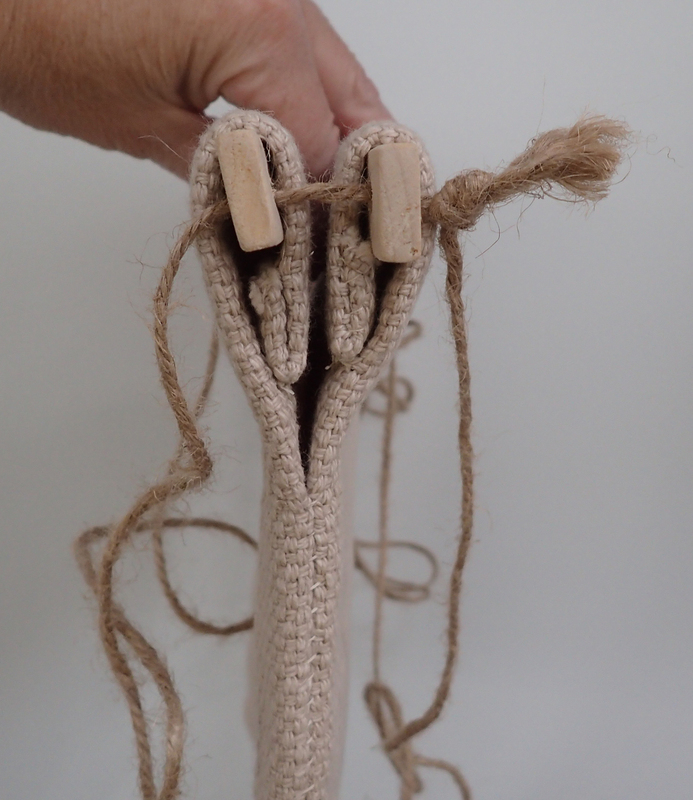 Jute / twine – I purchased jute to use as purse strap. I thought about using leather but leather might bleed on your garb if it gets wet. If you want to replace the jute that I have provided with your own leather, please feel free to do so. Whip stitch the seam allowances in place. 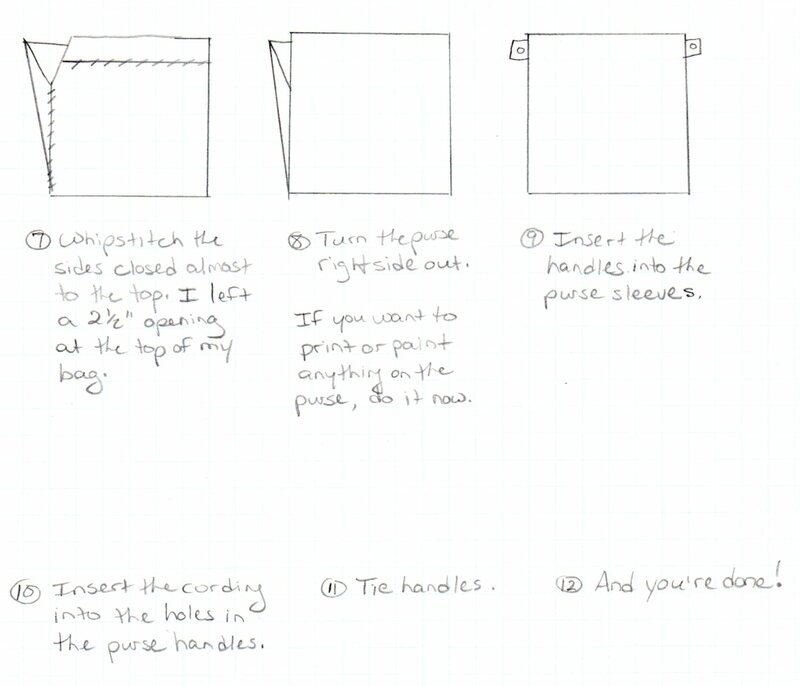 Fold the top of the purse over one of the wooden handles, forming a sleeve and stitch into place. You may want to make the sleeves large enough to remove the purse so you can wash it. 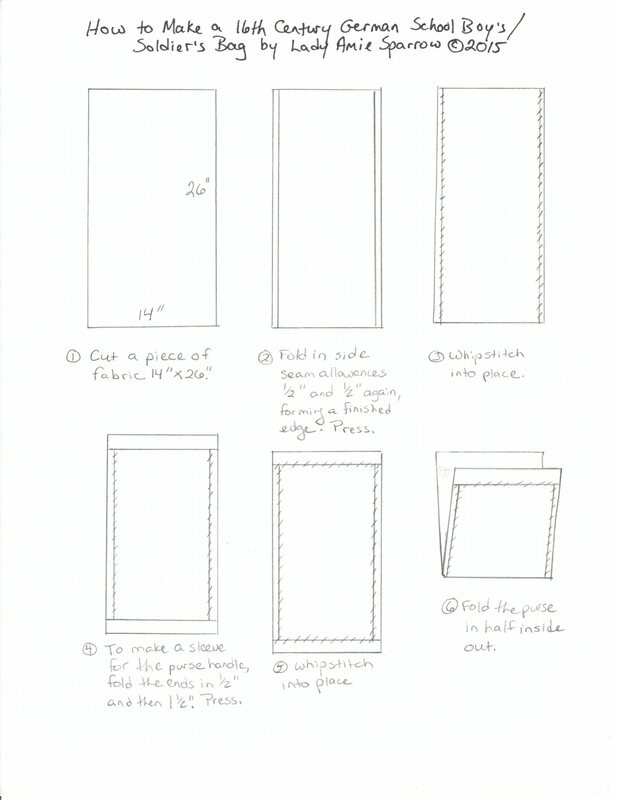 Once the sleeves are sewn in place, fold the purse in half and sew up each side about ¾ of the way. Put the jute/twine through the holes and tie. The image on the bag is created, I believe, by woodcut. I made a “woodcut” from an artistic medium that is more or less a giant eraser. It is easy to carve but it is delicate. My carving broke on the way to give this class. Bachman, Gunter, and Christa Balharek, Alpirsbach Zur Geschichte von Kloster Und Stadt. Landesdenkmalm Baden-Wurttemberg. 2001.